Fungi are one of the major cause of crop loss worldwide. HPM offers a number of Fungicide products to for plant protection from various fungi. 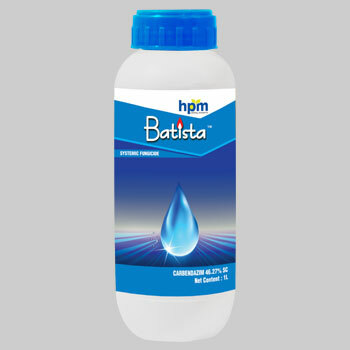 Batista is a Suspension Concentrate [SC] or Flowables in which the solid active ingredient is dispersed in a liquid together with additives to form a lasting stable water dispersible suspension. Dip the roots of seedlings for 10 - 30 minutes in this suspension shortly before transplanting. Carbendazim is a widely used, broad-spectrum benzimidazole fungicide and a metabolite of benomyl. Carbendazim inhibits beta-tubulin synthesis. Systemic fungicide with protective and curative action. Absorbed through the roots and green tissues, with translocation acropetally. Acts by inhibiting development of germ tubes, the formation of appressoria, and the growth of mycelia. It is very effective in adverse climatic conditions reduces surface runoff and provides uniform coverage over the foliage’s with enhanced stability & penetration. Seedling dip is recommended against some root diseases and soil infections. Dip the roots of seedlings for 10-30 minutes in this suspension shortly before transplanting. Carbendazim is moderately toxic for Sheepshead minnow, Channel catfish, Rainbow trout, and Donaldson trout. Bluegill. It is slightly toxic Dungeness or Edible Crab. It is slightly toxic for honeybees.It is highly toxic for aquatic organism, low bioavailability in surface waters makes it unlikely this toxicity will occur in the field.